See Dublin by land and by water! 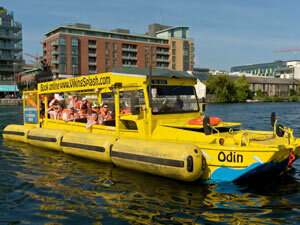 Board one of the amphibious World War II vehicles and see a whole new side of Dublin. On the tour not only will you get to see the Viking artifacts and buildings but also other monuments like the St. Patrick’s Cathedral, Trinity College and Georgian Dublin. You can either sign up for a regular tour or one that includes a meal at the famous Beshoff’s of O’Connell Street. Timings vary but the tour runs throughout the year. Advance booking is advised in order to avoid disappointment.